View More In Tool Pouches - Page 5. 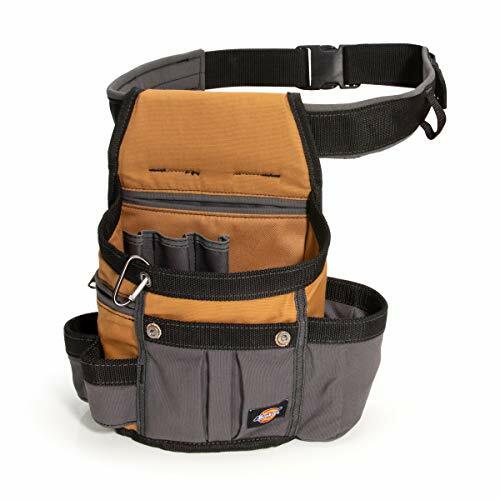 Keep your tools close at hand and perfectly organized with the Dickies Work Gear 57000 8-Pocket Utility Pouch with 3-Inch Padded Belt. Featuring 8 total pockets, this pouch offers the perfect amount of storage for any job, small or large. Webbing-reinforced pockets and loops enhance the already heavy-duty gray and tan canvas construction. The large interior pocket features 3 interior pockets and a wide mouthed slip pocket that allow for easy access to small tools, screwdrivers, wrenches, pencils and more. Three exterior pockets include a zippered pocket for securely storing small or valuable items. There’s also a pair of webbing-reinforced tool loops that can function as a hammer, large flashlight, or similar tool holder and carabiner for quick clip storage for keys or other items. The included 3-inch work belt is padded and fully adjustable, able to fit any waist from 32 to 56-inches, and is secured with a heavy-duty plastic buckle. If you have any questions about this product by Dickies Work Gear, contact us by completing and submitting the form below. If you are looking for a specif part number, please include it with your message.